The vast majority of lakes examined worldwide emit CO2 to the overlying atmosphere, through a process by which catchment-derived subsidies of terrigenous C, often in the form of dissolved organic carbon (DOC), augment within-lake CO2 production above the level consumed via photosynthesis. We show that shallow, macrophyte-rich lakes of the Mackenzie Delta, western Canadian Arctic, do not follow this pattern. These lakes are strong summertime CO2 absorbers, despite DOC concentrations at or above levels commonly shown to produce CO2 emission. Paradoxically, CO2 levels were lowest where DOC was greatest, in lakes which appear to be annual net CO2 absorbers, and have poor hydrologic connection to the terrestrial landscape. CO2 in these lakes is depleted by high macrophyte productivity, and although catchment-derived C subsidies are low, within-lake DOC generation appears to occur as a byproduct of macrophyte photosynthesis and evapoconcentration. 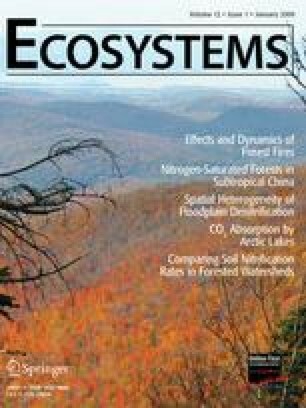 Additionally, after accounting for DOC and macrophytes, lakes that were least connected to the larger terrestrial landscape remained weaker CO2 absorbers, suggesting that CO2 balance may also be affected by DOC quality, foodweb structure, or inputs of pCO2-rich riverwater to connected lakes. In contrast, a small subset of Delta lakes that were strongly affected by permafrost melting were CO2 emitters, suggesting future permafrost degradation could engender a change in the overall CO2 balance of these lakes from near-CO2 neutral over the ice-free season, to clear CO2 emission. Our work suggests that the current paradigm of lakewater CO2 regulation may need to specifically incorporate shallow, productive lakes, and those that are poorly connected to their surrounding landscape. ST, LL, and RH designed the study, ST performed research, ST analyzed data, ST, LL, and RH wrote the paper. The online version of this article (doi: 10.1007/s10021-008-9213-5) contains supplementary material, which is available to authorized users. We gratefully acknowledge community organizations in the Inuvialuit and Gwich’in settlement regions who permitted this work to occur within their traditional territories. A. Chateauvert, E. Hines, L. Honka, L. Greenland, and E. Beasley provided technical assistance and J. Gareis provided helpful advice on sampling and logistics. The Aurora Research Institute and Polar Continental Shelf Project provided generous logistical support. Funds from the Natural Sciences and Engineering Research Council of Canada (NSERC Discovery Grant and Northern Research Supplement) to LFWL, and the Science Horizons Youth Internship Program, Northern Scientific Training Program, and an NSERC Northern Research Internship supported this study. Personal financial support to SET was from an NSERC CGS-D scholarship, a Simon Fraser University CD Nelson Scholarship, and a Garfield Weston Award for Northern Research.